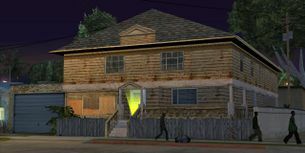 The Johnson House, the home of Carl Johnson and other Johnson family members, as depicted in Grand Theft Auto: San Andreas. An interior shot of the ground floor. The Johnson House is a 2-story, lower-class home on Grove Street, Ganton, Los Santos, which is the home of the Johnson family where Beverly Johnson raised her four children (Carl, Sweet, Kendl and Brian). Carl was born in the Johnson House, and it is possible that her three other children were born in the house. The house was the target of a drive-by shooting in early 1992, which cost Beverly her life (although the Ballas gang members were aiming for Sweet Johnson). Carl, who had returned from Liberty City, moves into the house after hearing the news of his mother's death. 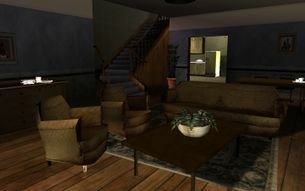 After the mission The Green Sabre, The Johnson House becomes unoccupied while Carl is in the Badlands and Sweet is in prison, Grove Street and the house will then lie within Ballas gang territory. Although the house is not vandalized, a druggie does steal the family blender out of the kitchen. The home falls back into the hands of Carl and Sweet after they return to Los Santos. The house is the place of the last cut scene of Grand Theft Auto: San Andreas, where Carl and friends share old memories together. The Johnson house is much larger than many other homes in Ganton, and unlike most houses in the district, the house is two story. It has many modern essentials including a television, rug, couches, and a game console on which you can play They Crawled from Uranus. A Wardrobe is also available upstairs, across from the bedroom. There is a garage located next to the house that can store up to two vehicles, but players are warned that they can disappear from this garage. In The Johnson House there are many weapon pickups available. In the upstairs bedroom there is a camera, and following the Tagging Up Turf mission a can of spray paint also spawns there. TEC 9 will all spawn in the kitchen. Brass Knuckles underneath the overpass next to Ryder's House. The Johnson House becomes an asset after the completion of the mission Doberman, where the Dollar icon will spawn outside the garage. After the mission Green Sabre, the House loses its asset status, although this is restored after completing Home Coming. The maximum amount of money The Johnson House asset will make is $10,000. Although the garage door will not open for vehicles after two have been stored in the garage, a third vehicle can be added by driving it up to the garage door, exiting and then entering the vehicle quickly and driving it in while the garage door is still open. But this is likely to make all of the vehicles in the garage disappear. This page was last modified on 14 November 2012, at 07:02.